I had a plan for Juneau. I was going ashore for one of the excursions, I forget which, and returning to the ship in time for a 2:30 massage appointment in the spa. I was sidetracked by an incredibly stupid problem, which I’ll describe below; but because I never got ashore, all the Juneau photos I took were from the boat. I ended up with a few, which you’ll find at my gallery Juneau. Juneau, like a lot of towns on the Alaska coast, sits in a deep inlet among mountains. A look at it on Google Maps will show you what I mean. So, my stupid problem. When I travel, I occasionally need to do laundry. I wear high strength compression hose, and since they cost over $60 a pair, I have just enough for a week, and the cruise was 10 days. So on the day we landed at Juneau, I went to the laundry in the morning to run a small load of compression hose. This should have taken about an hour. To do laundry on the ship you need a $3 bronze token, which you get from a vending machine, and you pay for it with your room card, which operates as a kind of credit card on board the ship. The machine in the laundry on my floor wouldn’t accept my room card. I called for help. A nice young man came in response, took my card, and vanished for some time. When he came back he said he had tried it on all 12 floors (?! yes, the ship has 12 floors with laundries), and it wouldn’t work in any of the machines. The nice young man then produced another man, with a key, who extracted a bronze token from the coin box of another washer for me. I got my laundry done; but by then it was too late for me to go ashore and still get back from the excursion in time for the massage at 2:30 PM. I dimly recall that when I first got my room card, there was some kind of mixup and I had to have it rekeyed; I don’t know if this is why it wouldn’t work but I’m suspicious. The other event while we were in Juneau was the affair of the purple bear. In Ketchikan I poked around in a gift shop, where I found and bought a little pendant, a bear totem carved out of what I’m pretty sure is low-grade amethyst. It was $16 so I snapped it up, and it’s one of my favorite pendants. I had it on when I went to the massage appointment I mentioned. As I was dressing after the massage, a young woman came into the dressing room; we chatted, and I showed her the bear, which she liked. When I got back to my room I realized I wasn’t wearing the bear. Well, I convinced myself on zero evidence that the young woman had palmed it. I checked with Lost and Found, who didn’t have it, and asked them to notify me if it turned up. Then I went back to my room to fume. Later that day they called me – a nice lady from a room down the hall had found it on the hall floor and turned it in. (Fortunately I hadn’t told anyone of my suspicions. I felt very silly.) It looks like the string it’s on was tied in a single knot, and simply untied itself while I was walking. When I got home, I asked Google how to tie a knot that wouldn’t do that, and the pendant is now secure. My other grumps about the day in and around Juneau were that the service at early breakfast was awful (no details recorded), and the boat was freezing cold all day. The massage, however, was very nice indeed. 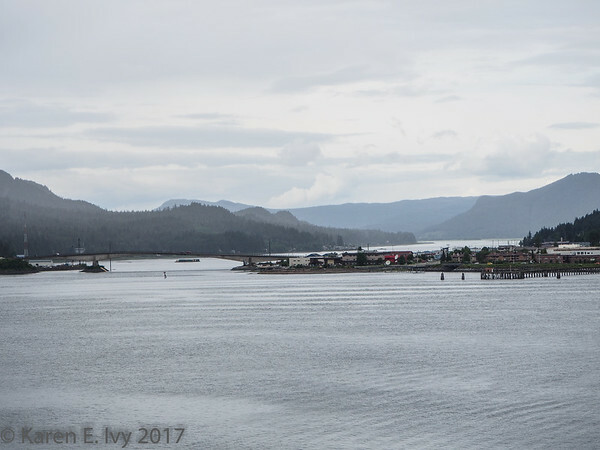 Apart from the photos of the harbor around Juneau, I took a couple of photos on the ship that I’d like to share. 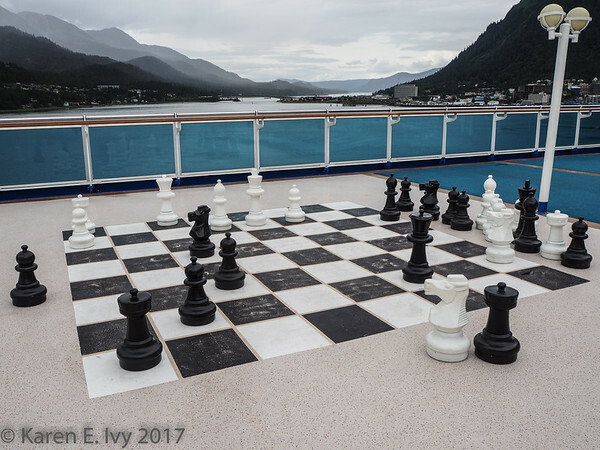 First was the chess board on deck 16. That’s not on a table. That’s on the deck, and the pieces are about 3 feet high. Players walk around on the board to make their moves. I wish there had been someone playing so I could show the scale. 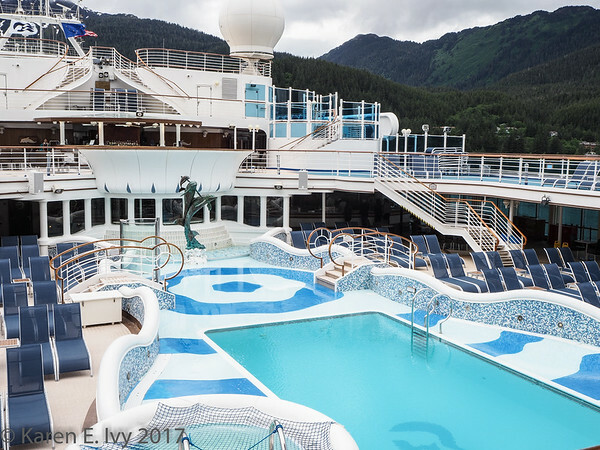 And here’s the outdoor swimming pool on deck 14. You notice nobody is swimming in it; it was a cold, overcast day, and there’s another pool on the same deck with a glass roof. I never did get a full count of all the swimming pools on that ship.